In a stormy three-hour session on Wednesday, several Egyptian MPs launched attacks against the press syndicate for asking the president to apologise and demanding the interior minister be sacked after policemen entered the syndicate building last week to arrest two journalists. Following the session, the MPs decided to entrust parliament's Media and Culture Committee with finding a solution for the ongoing crisis between the Journalists Syndicate and the interior ministry. Parliament speaker Ali Abdel-Al said the committee should invite representatives from all concerned institutions – including the Journalists Syndicate and the interior ministry – to meet in a bid to find a way out of the crisis. "The committee should help both parties to find common ground and then prepare a report to be discussed by parliament," said Abdel-Al. Following the incident at the syndicate headquarters last week, the syndicate called on news outlets to defy a gag order issued by the prosecutor-general on the arrest of journalists Amr Badr and Mahmoud El-Sakka, who face charges of publishing false news, inciting the public and plotting to overthrow the regime. "It would be an exaggeration for the syndicate to use the words ‘storming’ or ‘violating the sanctity’ of the building of the syndicate to describe what happened," said Abdel-Al. "While those who entered the building of the syndicate were simply implementing the law and not searching the building, the syndicate board should not have given sanctuary for those who were sought by prosecution authorities for investigation and questioning," said Abdel-Al. "All state bodies should help judicial and prosecution authorities implement the law rather than stand against it," said Abdel-Al, adding that "I cannot imagine that the Journalists Syndicate could choose to stand against the law, because the main message of the syndicate should always be aimed at promoting the rule of the law." "The parliament would not allow any institution to create crises or destabilise the country for political interests, or try to drive a wedge between state institutions." Abdel-Al's comments came at the end of a heated plenary session where some 30 MPs took the floor to discuss "information requests" about the dispute between the syndicate and the interior ministry. 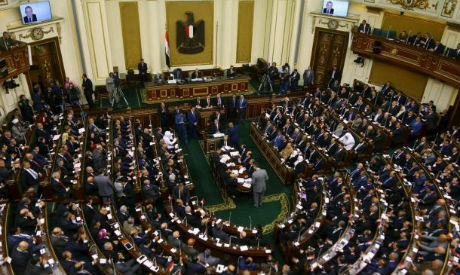 Most MPs launched scathing attacks against the syndicate’s board, with some accusing them of exploiting the crisis to tarnish the image of President Abdel-Fattah El-Sisi. Some MPs used a terrorist attack that took place in Cairo earlier in the day as ammunition to attack the syndicate, with independent MP and journalist Mostafa Bakri accusing the board of “paving the way” for the crime. "The syndicate's description of policemen as ‘thugs’ helped give terrorists an excuse to commit their crime in Helwan today," said Bakri. It was earlier believed that the debate would be postponed in a bid to give a chance for mediators to help mend fences between the syndicate and the interior ministry. However, the majority of MPs, including some journalists, chose to address the issue, insisting that it is the syndicate – rather than the government or president El-Sisi – that should issue an apology for what happened on 1 May. Other MPs, including the chairman of the parliament's Human Rights Committee, urged parliament to take a friendly stance rather than attack journalists. MPs Nashwa El-Deeb and Emad Gad said that the session was exploited by some to "demonise" journalists. However, speaker Abdel-Al said that parliament stands in firm respect of journalists and freedom of speech, and would do its best to find a solution for the crisis. Osama Heikal, a journalist and chairman of parliament's Media and Culture Committee, began the debate by accusing the board of the syndicate of fuelling the crisis. "When I made a lot of contacts with the prime minister and the interior ministry to contain this crisis, they were clear that they were just implementing the law in a criminal case and were by no means targeting the syndicate or press freedoms," said Heikal. “However, when I contacted the head of the syndicate Yehia Qallash to urge him to refrain from issuing escalatory statements on the crisis, he said that ‘young journalists would tear me up if I told them to do this’." Heikal accused the board of doing everything possible to inflame the crisis. "This is despite the fact that it was not an issue of freedom of speech, but a purely criminal matter," said Heikal. Joining forces, Abdel-Rehim Ali, an independent MP and journalist, said that "while policemen are sacrificing their blood to safeguard the country against terrorists, we see that the Journalists Syndicate is taking a nervous stand, putting itself above the law and trying to drag the president of the republic into this conflict by any means." Abdel-Hamid Kamal, a leftist MP, said "the crisis should be discussed in an objective way." "I attended the meeting of the board of the Journalists Syndicate on Saturday to urge them to open contacts with the parliament speaker to find a friendly solution and reach the truth," said Kamal. By contrast, Mostafa Bakri, an independent MP and journalist, took a fiery line against the Journalists Syndicate, asserting the members of the board of the syndicate have turned its building into a sanctuary for "revolutionary socialists,” the 6 April movement and remnants of Muslim Brotherhood. "They have even allowed Brotherhood elements help hostile television channels like El-Sharq to cover events inside the syndicate in detail," said Bakri. Bakri said prosecution authorities – rather than interior ministry officials – were the ones who gave orders for policemen to go into the syndicate building and arrest two activists. "In spite of this, they insist on escalating against the interior ministry for political reasons," Bakri said. Anwar El-Sadat, chairman of the Human Rights Committee, said he was clear in rejecting the demands called for at an urgent syndicate meeting last Wednesday. "It was too much for the syndicate to ask for an apology from the president of the republic and the interior ministry," said El-Sadat. He did, however, urge MPs to seek reconciliation between the syndicate and the ministry. "We are not in a battle of losers and winners and we should not give the chance for anyone to exploit such crises to destabilise the country," Sadat said. Galal Awara, an independent MP and a TV anchor, recommended that the case be “left to judicial authorities to settle." "The conflict now is between the Journalists Syndicate and prosecution authorities, and not the interior ministry," said Awara, adding that "the syndicate helped two persons – one of whom is not a journalist –hide in its building, and when they were arrested under orders from prosecution authorities, they want to put themselves above the law." Independent MPs Ihab Ghatati and Mohamed Abu Hamed charged that the building of the Journalists Syndicate has become a battleground against the state. "They opened the doors of the syndicate for foreign and hostile media to tarnish the image of the country for political reasons," said Abu Hamed. On the other hand, Nadia Henri, an MP with the Free Egyptians Party, urged state authorities to respect the dignity of professional syndicates. MP Abdel-Moneim El-Oleimi recommended that parliament discuss the state of the media and the press in general. "The discussion in the Media Committee should not be confined to the crisis," said El-Oleimi, adding that "the committee should make a review of the violations made by the Journalists Committee, the debts of press organisations and new media laws." El-Olimi asserted that "just 10 percent of the members of Egypt's Journalists Syndicate are true journalists, while the remaining 90 per cent are not involved in media or press activities." "We should ask the syndicate why and how these people were able to get press cards," said El-Olimi. Salama El-Gohary, an independent MP and a former military officer, claimed that "anyone can get a press card in Egypt from the Journalists Syndicate in return for a bribe of EGP 50,000." "I am a former military man, but I was able to get a press card from the Journalists Syndicate," said El-Gohary.